Inverter lifecycle: Inverters have an interesting and varied lifecycle, it is not always obvious where each of your inverters are within this lifecycle; from identifying the need, to maintaining and servicing your inverters, to upgrading and recycling. At IDS we look to partner with our clients to provide a full range of support services throughout the lifecycle of your inverters. An initial reliability assessment gives fresh eyes to the position of your inverters within their lifecycle, the environment and inherent risks. A Drive Diagnostic assesses the performance of your existing drives including analysing error logs. Prior to purchasing there are two services you may want to consider: Energy Surveys and Harmonic Distortion Surveys. IDS offer an Energy Efficiency Motor Audit to estimate the potential energy that can be saved by adding an inverter to the motors that run your applications. A Harmonic Distortion Survey can be commissioned to analyse harmonic affects. The second phase is order and delivery. As an ABB Authorised Value Provider (AVP) we have £400k of inverter stock with powers up to 500kW. IDS engineers are highly experienced and sit regular ABB examinations to maintain our AVP status. 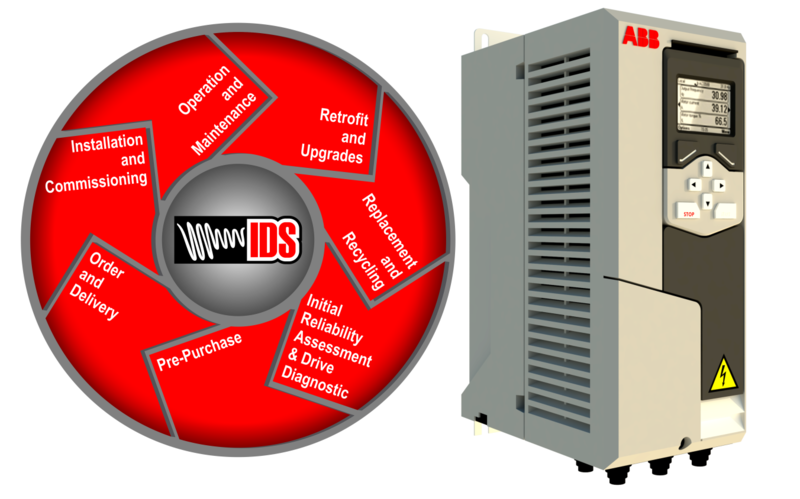 We are authorised by ABB for sales, support and service of ABB inverters. This is traditionally the longest element of the inverter lifecycle. Operational inverters, just like any other application needs to be maintained. We use approved ABB preventative maintenance kits, offer inverter service contracts, provide a repair or replace service, 24-7 breakdown assistance and have a large stock of hire drives to get you operational as quickly as possible. Retrofits consist of updating older equipment to more modern equivalents where the change is relatively minimal. This is the last phase of an inverter lifecycle. Where very old inverters exist there is the option to replace them with newer models which are generally smaller, more efficient and more appropriate for modern day equipment. We ensure all inverters that are replaced are recycled in the correct manner.